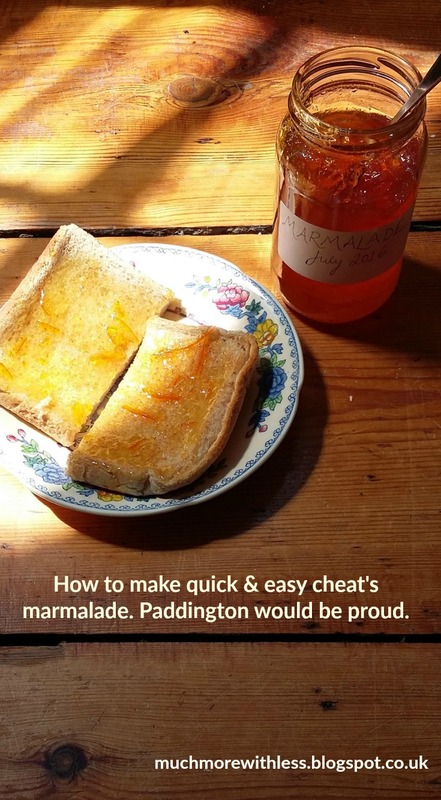 Have you ever made marmalade? When we moved to the country, I had idyllic visions of making jam, bustling about bottling things with great big pans bubbling away on the Aga. We’d harvest the plums from the tree in the secret garden, have family outings to go blackberrying, snap up Seville oranges and then come home and cram it into delicious jewel-bright jars. 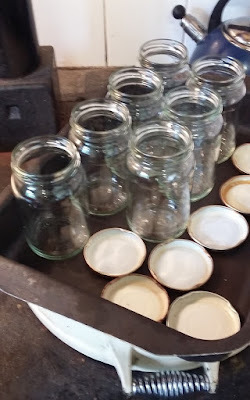 I duly hoarded jam jars like the worrying subject of a Channel 4 documentary, and insisted on a special trip to Aldi when preserving pans and jam thermometers were on special buy. Somewhere along the line, life intervened. The shiny new pan has spent a year stuck at the back of the shelf. But I still had the best of intentions. 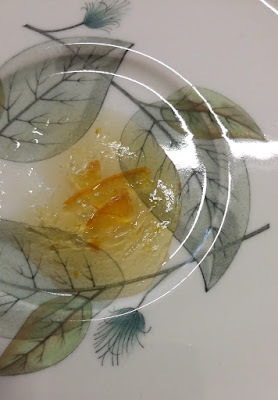 My grandmother made marmalade. My mother still makes marmalade. 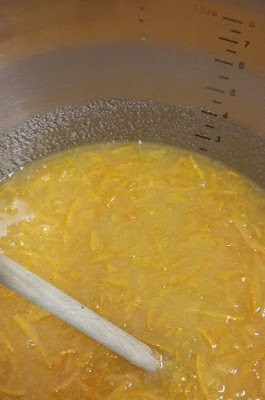 I wanted to make marmalade too, even if I did try to gloss over memories of quite how much chopping, straining and swearing was involved. As the Seville orange season came and went, I resigned myself to another year without attempting home-made marmalade. So when I saw a battered jar of Ma Made on the reduced shelf in the Co-op, I had to buy it. The list of ingredients was reassuringly short – seville oranges, water, citric acid aka lemon juice and pectin, as a setting agent. My £1 purchase promised 6lbs of home-made marmalade in 30 minutes, just by adding sugar and water. I only had to follow the instructions on the label. No peeling and chopping of reluctant oranges would be necessary. Hartley’s had done all the hard work for me, and put it in a tin. (Of course, Hartley’s could do even more of the hard work, and put it into jars of marmalade, but don’t knock the dream here). It took a mere two months for me to buy the sugar, use the sugar for something else, buy more sugar and finally get round to cleaning the jars and actually making the marmalade. 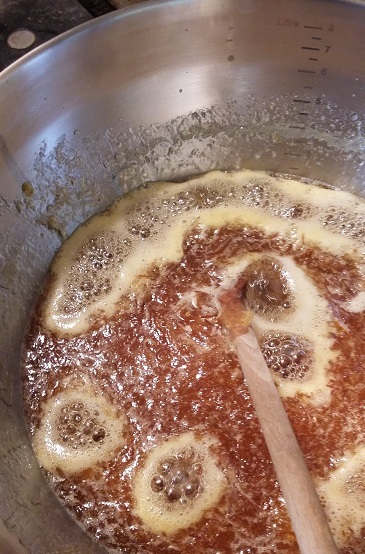 Here’s my report from the marmalade-making coal face. Ma Made, sugar, water. That’s it. £1 for Ma Made, plus 80p for the sugar needed, so £1.80 for 7 jars, making them 26p each. I reused jars from jam we’d already eaten. 1. Do lengthy calculations to work out how many jars will be needed, based on normal jars of jam containing 454g and the tin of Ma Made promising 6lbs of marmalade. Only realise that normal jars contain roughly 1lb, so that means 6 jars, after resorting to a spreadsheet. Doh. 2. Liberate some of the massed ranks of hoarded jam jars, with a sense of relief that they are finally coming in useful. Demand your children return some of the jars filched for potion making so you can have matching lids. 3. Remember previous attempts at making cranberry conserve, and running out of sterilised jars. Add an extra one for luck. 4. Bung the jars in a hot wash in the dishwasher, lids and all. 5. Retrieve enormous jam pan from the back of the cupboard and give that a wash.
6. Battle with tin opener to opened dented tin of Ma Made. Somehow succeed in getting the contents out. What Ma Made looks like, when you’ve finally got it out of the tin. 7. Try a tiny bit of Ma Made. Regret tasting a tiny bit of the Ma Made. Realise the recipe requires adding a truckload of sugar because the starting point is very bitter. 8. Add the 425 ml (3/4 pint) of water. There’s even a handy measuring mark on the side of the jar. 9. Add the truckload of sugar. Feel pleased that Morrisons were selling massive 2kg bags for 88p. 9. Stir in the sugar, and bring it to the boil. 10. Wait for the damn stuff to boil. 11. Curse the bit of the instructions that says “stir continously” while bringing to the boil. 12. Decide intermittent stirring will be sufficient. 13. Realise that if you use an elderly Aga, and have just put an enormous pan of cold stuff on top, after already cooking two sets of noodles and two sets of stir fry, the chances of there being enough heat left to bring it to the boil any time soon are approximately nil. Curse the Aga. Pause for short day dream about modern hobs that actually, you know, heat things. 14 Realise the final of the Great British Sewing Bee is about to start. Remove mildly warm marmalade mixture from the hob, cover the pan with a tea towel, and abandon marmalade-making attempts for this evening. 16. Resume marmalade making attempts the next day. Marvel when the marmalade finally does come up to the boil. Marmalade, boiling. Why couldn’t you do that the night before, eh? 17. Officially: “Reduce heat, maintain boil for a further 15 mins, stir occasionally”. In practice, attempt to supervise stirring by children briefly keen to help, to avoid super-heated sugar syrup disasters. 18. Note instruction on tin to “Add a knob of butter during boiling to disperse foam”. Realise have run out of butter. Decide to ignore any foam. 19. Get excited about testing for setting for the first time (I don’t get out much). 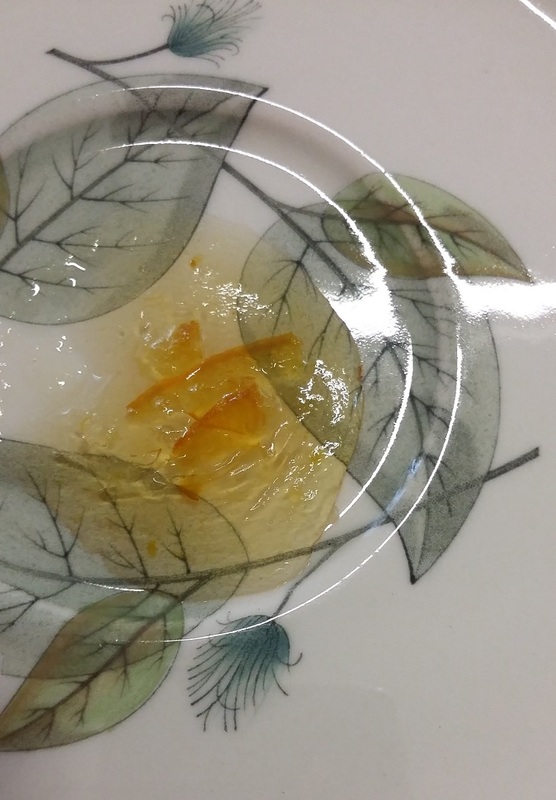 Tin says “Put half a teaspoon of marmalade onto a cold saucer and put in a cool place.”. Assume if it meant the fridge, it would say the fridge, so maybe not that cold. Compromise with putting the saucer on the back stairs, as one of the chilliest places in the house. Setting test, with a few wrinkles in the marmalade if you look really hard. 20. Officially: “Test after 2 minutes, by drawing a finger over the surface. If it wrinkles, setting point has been reached. If not, reboil for a few minutes. Test again.” Well, I tried the finger business after two minutes, and it seemed a little bit wrinkly, so I kept the marmalade boiling for a few more minutes, then took it off the heat and had another go. 21. Fend off child who has returned just as I am retrieving a pan of clean jars from the roasting oven, where they’ve been heating them for 10 minutes to destroy any remaining bugs. Suggest they taste the setting point sample. Washed, heated jars. They’d better be clean now. 22. Am informed the marmalade would benefit from a touch of lemon juice. By my six-year-old. Sigh. 23. “Leave marmalade to stand for a further 2-3 minutes, before pouring into warmed jars.” The wide mouthed metal funnel I was given years ago came in really handy here, for transferring hot marmalade from an enormous pan into the jars with minimal mess. 24. Feel relief about cleaning an extra jar – the mixture filled 7 jars rather than 6. 25. The instructions reckon that if the peel floats, stir contents of each jar. Am unsure about level of floatage. Stir anyway. 26. Put the lids on. Or parchment or film, whatever you fancy. 27. Search for the small sticky labels suitable for jam jars. Fail to find them. Resort to enormous parcel labels instead. 28. Gaze on your seven jars of marmalade with great pride. 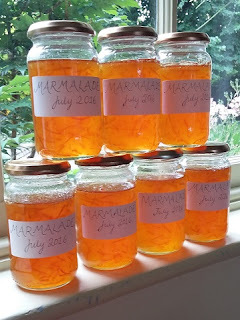 Love the glowing orange colour when the sun shines through the marmalade. 29. Sit in the sunshine eating toast and marmalade, even if you have run out of butter. Lemon juice? Pah. I think it tastes just fine. Paddington would be proud. Anyone else enjoy making marmalade? From scratch, or with Ma Made? Or is it just too much faff? Keen on jams and jellies? Check out my post on making cranberry sauce for Christmas. I make all our marmalade. 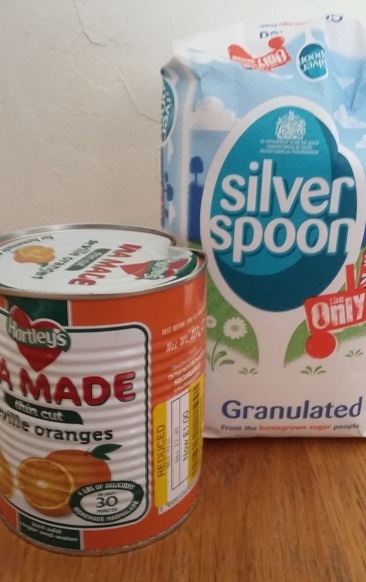 I often use half a tin of mamade with my recipe for sweet orange marmalade when I've found some bargain oranges. Need to do a few sums for quantities of sugar and water but tastes great. Sweet orange marmalade is a soft set so the mamade helps with that. I cook the oranges in the pressure cooker which makes the chopping easy. Top tip about combining Ma Made with extra oranges, sugar and water, thanks. Just smiled all the way through this, I've been making cheats marmalade for ever but never with as much fun as you had! At Lakeland you can buy the tins of Lemon ma-made and I've varied this by adding limes too – more fun for you! (look under lemon and lime marmalade in my labels on the blog) Enjoy! Thanks for the tip. Now I'm nostalgic for Chilvers Lime Marmalade, my Newcastle grandmother's favourite. I so am a point 12 sort of bloke – made me laugh. Oh good glad it's not just me. It's advantage over many recipes is that you boil the fruit and then slice it, which is SO much easier and quicker than chopping the raw citrus and then cooking it. 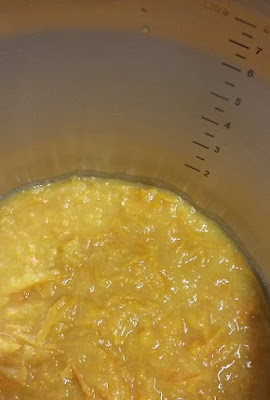 There are variations (given in the book but not the weblink) for making Seville orange marmalade, but I most often use the basic recipe and use whatever needs using up, most recently a very successful combination of sad looking satsumas, lemons, an elderly lime and a couple of eating oranges. Great way to use up abandoned citrus fruit, thank you! Since you didn't do the hot water bath, complicated thing, how long will that last without going bad. How or where do you store these ? I wash the jars and lids in a (very hot) dishwasher cycle. Then fill the jars while marmalade still very hot and screw on tops. It lasts indefinitely. Remember, it’s mostly sugar. P.S. I sometimes add 3 jars of ginger marmalade, stir until it’s melted in. Great taste. Good option using jars and lids straight from the dishwasher – and ginger marmalade sounds delicious! It sounds like something I would make if I liked Marmalade! Now if they sold a similar tin which made blackcurrant jam……. I know I am late to the party but here’s how we changed it up a bit. I replace some of the water with scotch whisky. Pretty sure the alcohol boils off but it sure adds a nice mellow flavour to the jar. Now I’m off to make a batch with candied ginger. I think the family will like that. I live in Canada and am on a constant look out for Mamade. It really hard to find and it’s hit and miss at best so whenever I do find it I buy six to eight tins of the stuff. I love marmalade and over the years have given jars of my ‘homemade’ marmalade as gifts and now have a few regulars for whom I am the supplier. I have only ever found the thin cut, would like to try the thick sometime. Love the idea of adding ginger, I make a rhubarb ginger marmalade that is delish. Enjoyed your post, my kids are grown but so relate to your experience! Hi Janetta – Thanks for commenting. A jam thermometer sounds like a brilliant idea. I didn’t have one when I did this batch of marmalade. Think it needs to be 104.5 degrees C for setting point, but you probably know better than I do! Suspect doing two tins at once would be absolutely fine, although I haven’t tried it. Good luck with the school fete! Loved reading your post which I stumbled upon after purchasing some Ma Made from Amazon in hopes of whipping up a batch in time for Christmas (4 days away). Like your 6 year old, my fear is it will be too sweet so I’ll take the lemon suggestion. Thanks for sharing your experience & your humorist talents! Hi Patty – So glad you liked the post! Good luck with your MaMade, hope it tastes delicious. I’ve just been making cranberry sauce for Christmas, with the whole dishwasher/jar heating rigmarole all over again. I’ve been using MaMade for 30+ years and have honed my technique. For 1 tin, use 700 grms white and 200 grms moist brown + as much finely chopped crystalized ginger as I can be bothered to do! NO water, (as it only has to be boiled off to set) And there’s ‘gelling agent in it now- whatever that is!! It doesn’t need a huge pan either, I stir it all to mix then LEAVE it overnight – or a bit longer, bring to the boil turn down the heat, stir – occasionally! Give it 15-20 mins. Then pot up, I warm my jars on a rack over the pan, this stops the glass cracking from the heat! I’ve never had scum and couldn’t use butter because my dairy intolerant grandson – who loves it wouldn’t be able to eat it! Enjoy. Fascinating about not adding water as it just has to be boiled off. I must be brave and give it a try. Thanks so much for sharing all your MaMade experience. 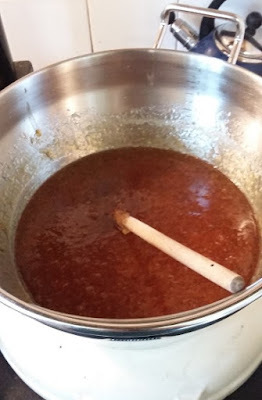 I use 1/2 lb less sugar, boil for 30 minutes and add 2 tablespoons of brown rum for extra bite. Much better than shop bought and not too sweet. Hi, can this be processed and made shelf stable? my sister takes at least 10 for choir so she refunds cost of ingredents. 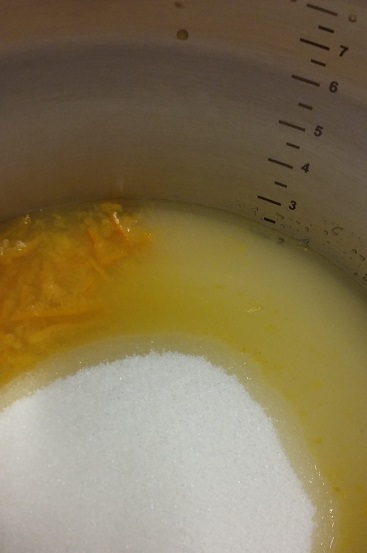 Just about to make some marmalade, so enjoyed your blog! I have taken on board some of the other ideas and will be using a little less sugar and mixing that with brown in the hopes of a more bitter finish.